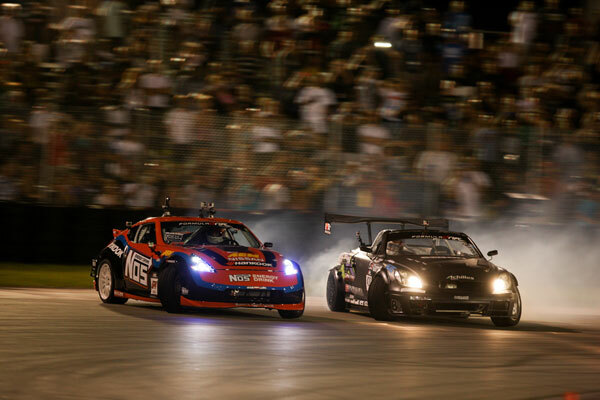 Long Beach, Calif. – December 5, 2012 – LONG BEACH, Calif. (Dec. 4, 2012) – For the first time in its 39 years, the world-famous Toyota Grand Prix of Long Beach, April 19-21, 2013, will offer night racing with the inaugural Formula DRIFT Super Drift Challenge on Friday and Saturday nights during race weekend. The Formula DRIFT Super Drift Challenge, which will take place at 7 p.m. on the eastern end of the race circuit – turns nine, 10 and 11 – is expected to feature 16 of the sport’s top cars and drivers including 2012 Formula DRIFT champion Daigo Saito, 2011 champ Daijiro Yoshihara, plus Frederic Aasbo, Aurimas Bakchis, Michael Essa, Conrad Grunewald, Ken Gushi, Tyler McQuarrie, Robbie Nishida, Justin Pawlak, Matt Powers and others to be announced. Friday’s action will include practice and qualifying runs, while Saturday will see the teams compete for a $25,000 prize. On Sunday, the Super Drift Challenge cars will drift the entire race circuit after the featured IZOD IndyCar Series race. Grand Prix fans that purchase any admission ticket for Friday or Saturday racing activities will be able to see that day’s Super Drift Challenge. Seating for the Super Drift Challenge will be in Grandstands 16, 18, 24, 25 and 26 on a first-come, first-serve basis beginning at 6:30 p.m. Ticket prices for the three-day event range from $28 for a Friday General Admission ticket to $130 for a three-day ticket that includes Sat./Sun. reserved seating in grandstand upper levels. Pre-paid parking packages are also available, along with handicapped seating, IndyCar Paddock passes, Super Photo tickets and a wide variety of Hospitality Club packages. Fans can select and pay for their 2013 Toyota Grand Prix of Long Beach seats, parking and paddock passes online at the new gplb.com. Ticket orders can also be placed by calling the toll-free ticket hotline, (888) 82-SPEED.